Please call 916-565-1400 With Any Questions. The Outback boasts the functionality, stability and utility to get the job done. All kayaks are created equal, right? Hardly. 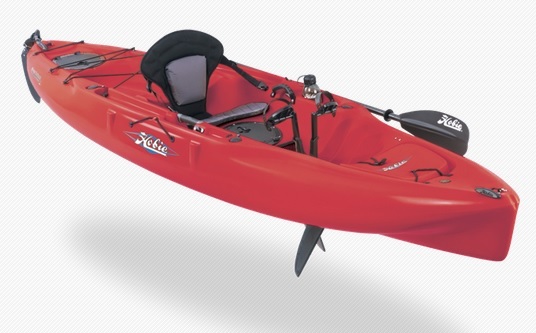 Peer closer at the Hobie Mirage Outback and the distinction between lesser kayaks becomes obvious. Stand-out features include a nearly indestructible rotomolded polyethylene hull, a MirageDrive for paddle-free touring, ample above- and belowdeck stowage, a Twist and Stow rudder for finger-tip steerage, and multiple molded-in rod holders. Best yet, a beamy hull provides form stability, allowing you to cast—or land the big one—without rocking the boat.